The Barry and Meredith Eggers Entrepreneurial Seed Funding Prize was established in 2015 with a generous gift from UCLA alumnus Barry Eggers. 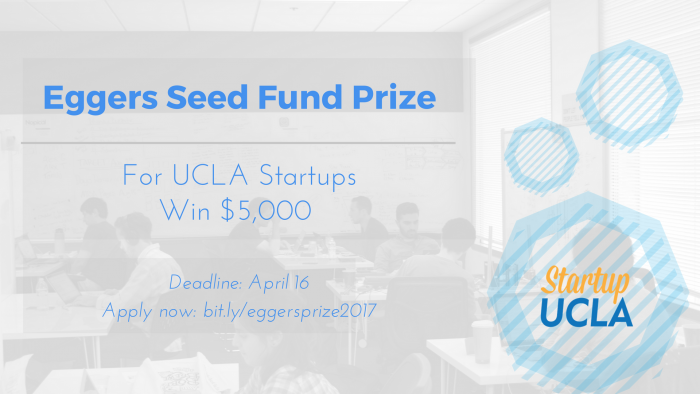 The prize will be awarded to a UCLA student or alumni led team for the development of a startup venture. The first prize was awarded in January 2016 to UAV-IQ Precision Agriculture. “It gives me great satisfaction to know that I am playing a vital role in advancing UCLA’s mission of research, education, and public service,” says Eggers. Apply to be an intern with Startup UCLA for Fall 2017!